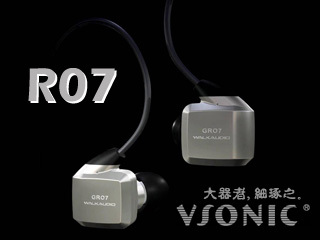 Almost 3 years after announcement, Vsonic finally releases the R07 (also called GR07) to the market: silver cable, 50ohm impedance, 11mm dynamic transducer, bio-cellular diaphragm that has hundred of layers fused together and user adjustable nozzle angle. Official price? Around US$150.